Pull Out Ironing Board Vanity Cabinet Storage Adjustable White Chrome Finish. Rev-A-Shelf has ironed out the inconvenience of storing and setting up that bulky ironing board with the introduction of its VIB Series. 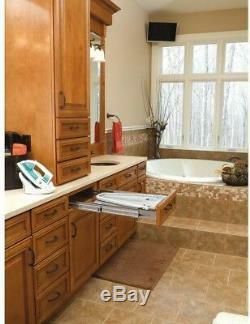 The uniquely designed expandable frame mounts easily in a vanity drawer between cabinet sides from 14-1/4' to 21' wide and the fixed brackets allow for easy mounting of all standard drawer fronts. It features a chrome finish and unique ball-bearing slide system that provides sufficient over travel for maximum utilization. Simply open until the gravity lock engages, unfold board and you are ready to iron! : 19.86 in Product Height in. : 4.0 in Product Width in. The item "Ironing Board 4 in. W x 19.86 in. D Fold Out Ball-Bearing Slide System" is in sale since Tuesday, January 30, 2018. This item is in the category "Home & Garden\Kitchen, Dining & Bar\Kitchen Storage & Organization\Racks & Holders". The seller is "epicdeals2919" and is located in Luckey, Ohio. This item can be shipped to United States, Canada, United Kingdom, Denmark, Romania, Slovakia, Bulgaria, Czech republic, Finland, Hungary, Latvia, Lithuania, Malta, Estonia, Australia, Greece, Portugal, Cyprus, Slovenia, Japan, China, Sweden, South Korea, Indonesia, Taiwan, South africa, Thailand, Belgium, France, Hong Kong, Ireland, Netherlands, Poland, Spain, Italy, Germany, Austria, Bahamas, Israel, Mexico, New Zealand, Philippines, Singapore, Switzerland, Norway, Saudi arabia, Ukraine, United arab emirates, Qatar, Kuwait, Bahrain, Croatia, Malaysia, Brazil, Chile, Colombia, Costa rica, Dominican republic, Panama, Trinidad and tobago, Guatemala, El salvador, Honduras, Jamaica, Uruguay, Antigua and barbuda, Aruba, Belize, Dominica, Grenada, Saint kitts and nevis, Saint lucia, Montserrat, Turks and caicos islands, Barbados, Bangladesh, Bermuda, Brunei darussalam, Bolivia, Ecuador, Egypt, French guiana, Guernsey, Gibraltar, Guadeloupe, Iceland, Jersey, Jordan, Cambodia, Cayman islands, Liechtenstein, Sri lanka, Luxembourg, Monaco, Macao, Martinique, Maldives, Nicaragua, Oman, Peru, Pakistan, Paraguay, Reunion, Viet nam.